In 1975, Australian Ken Warby approached Tom Fink, dean of engineering at the University of New South Wales, for technical advice in turning his hydroplane into the world’s fastest boat. Warby described the spruce, plywood, and fiberglass craft, built in his Sydney backyard, as “a box with an engine in it and a couple of skis put in front to plane it.” Fink, an aerospace engineer, found that in fact it was well developed but needed streamlining and a tail plane for stability. He also advised conducting wind tunnel tests and adding streamlined cowlings and air scoops. Fink’s colleague, Lawrence Doctors, carried out the wind tunnel analysis, and Warby added the extra parts as he could afford them. In 1977, Warby achieved his goal after Fink, making last-minute calculations, persuaded him to cut a few inches off the rudder to reduce drag. Powered by a military surplus Westinghouse jet engine, Warby’s Spirit of Australia blazed across the lake at Blowering Dam in New South Wales at 288.59 miles per hour, setting a new world record. The following year, with a rebuilt engine, Warby pushed the boat to 317.58 miles per hour, setting what to this day is the world speed record on water. Four decades later, speed still preoccupies naval engineers and architects, but few design for the ideal water surface Warby found on a dam-created lake in 1978. Instead, whether designing speedboats, warships, passenger liners, or even remotely piloted robotic vehicles, most need to aim not just for greater speed but for fuel efficiency and durability. Compared with Tom Fink, today’s engineers have better tools in the form of sophisticated computer hydrodynamic modeling and simulation. This is Kevin Maki’s field. An associate professor of naval architecture and marine engineering at the University of Michigan, Maki uses supercomputers to analyze water flows around vessels, developing models to make them not only faster and more fuel efficient but also structurally able to withstand rough seas. Winner of a 2014 Young Investigator award from the Office of Naval Research, he also looks for new ways to predict the impact of waves on marine structures, be they vessels or offshore oil platforms. Designing ship hulls with geometries that can improve speed and fuel efficiency is difficult because of the mathematically complex nature of turbulence. “We have to compute how turbulence behaves both at its smallest scales—say, 5 microns, about the size of a red blood cell—all the way up to the size of a ship, which can be 1,000 feet long,” says Maki. A new strategy Maki and his colleagues are pursuing is to have vessels blow bubbles from the bottoms of their hulls, creating air cushions that essentially lubricate ships as they move through water. Researchers have found that air lubrication can significantly cut down frictional drag—more than 500 times as great in water as it is in air—and thereby improve fuel efficiency. This is important to international shipping, which consumes 8.6 percent of the world’s oil supply. In 2008, marine-engineering firm DK Group in Rotterdam reported drag reduction of up to 7 percent after installing an air lubrication system on a cargo ship plying Norway’s Oslo Fjord. The system pumped air about 25 feet below the waterline into broad, shallow recesses built into the underside of the ship’s hull. Similarly, Mitsubishi confirmed a 5 percent improvement in fuel consumption after installing an air lubrication system on a newly built ferry in 2012. Michigan engineers anticipate even greater efficiency, estimating that air lubrication can ultimately help large ships reduce fuel use by 10 percent to 20 percent. Yet questions remain as to what design is best. Should bubbles, for example, flow from one long slot on the bottom of the ship’s hull, or from many apertures? Maki and his colleagues investigated how air spreads beneath a flat surface after it is injected from an opening into flowing water. “We studied the angle of the air jet and the placement of the orifice,” Maki says. “We’d want the orifices to be as close to the bow as possible, so air can travel along the whole length of the hull. However, we don’t want the air right at the bow, since then the air would just float to the surface. We need the air to stay trapped near the bottom for as long as possible.” Future research will investigate what hull shapes might do best with air lubrication. “We expect differently shaped hulls might prove better at trapping air,” Maki says. One improvement to hulls adopted by the U.S. Navy is a stern flap, a small extension of the bottom surface of the ship’s hull that juts rearward from its back end, effectively lengthening the vessel. The benefits emerge from the way ships generate waves as they move through the water. The faster ships go, the more these waves can essentially pile up, such that ships have to contend eventually with what Maki calls “a mountain of water.” By making a ship longer, a stern flap also lengthens the waves the ship generates. Longer waves require higher speeds to pile up. The result is less resistance, lower fuel consumption, and a higher top speed and range. “You can make faster ships that are also more fuel-efficient,” says Maki. The Navy, which currently employs stern flaps on some destroyers and amphibious assault ships and is experimenting with the flaps on cruisers, frigates, and patrol craft, estimates they can save up to $450,000 per ship annually. The Coast Guard uses stern flaps on its Hamilton-class high-endurance cutters. A perennial impediment to speed on the ocean is the barnacles, algae, mussels, and other marine organisms that cling to ships’ hulls, increasing weight, drag, and fuel consumption. This “biofouling” not only costs shippers worldwide more than $150 billion per year but compounds the problem of spreading invasive pests around the globe. To combat it, hulls are often painted with toxic chemicals that deter or kill pests. These coatings are costly. They also tend to poison species indiscriminately, need to be replaced regularly, and are often not completely effective. At Kiel University in Germany, graduate student Dennis Petersen and his colleagues may have found a solution. Studying how barnacles can glom onto surfaces underwater, they found that a barnacle’s adhesive works like most glues, starting off as a liquid so it can flow across surfaces before setting hard. They reasoned that if there was a way to prevent this adhesive from coating or “wetting” a surface before hardening, the barnacle might not stick. They developed a nontoxic silicone-based material covered with mushroom-shaped microscopic structures. These tiny bulges generate an upward force against liquids. The team submerged plates covered with these structures in the Baltic Sea for 17 weeks. Although some barnacles did grow on these plates in the first seven weeks, they subsequently disappeared, apparently pulled off by churning waves. The researchers also stuck a patch of the mushroom-like coating on a Kieler Yacht Club sailboat before it embarked across the Baltic and the North Seas. When the boat returned after seven months and 1,800 miles, no barnacles had stuck to the patch. The researchers are now tinkering to find the ideal texture. As they try to overcome various sources of friction, researchers are also gaining a better understanding of the stresses that hulls experience when they collide with wave after wave at sea. With the Arctic opening up to navigation, shippers will also want to know how vessels behave when hitting pieces of ice. At New York University’s Tandon School of Engineering, researchers recently conducted an experiment seeking to mimic a ship encountering an ice floe. They plunged a solid wedge into a tank of water containing a buoyant cylinder, with sensors measuring the pressure the wedge experienced and the flow of water around the wedge. The results were unexpected, says Maurizio Porfiri, a professor of mechanical and aerospace engineering. One might intuitively expect the wedge to experience more pressure from the water on the side facing the cylinder and less pressure on the other side, just as one might expect an echo to seem louder to the ear closest to an echoing wall than the ear farther away from it. However, the researchers found the opposite might be true with the wedge. “From an engineering point of view, this calls for serious study into how to design materials to deal with vibrations that you might not have anticipated,” Porfiri says. Studying stresses on hulls is important for another reason: possible future use of relatively lightweight composite materials in shipbuilding in place of metal. Ships made entirely of such materials are far in the future, says Porfiri, but we might see composites used in decks. Already, he notes, several companies are starting to employ composite hulls for autonomous underwater vehicles. Lighter ships would sail faster, but engineers are concerned that the repetitive impact of waves might generate large stressful vibrations. “These could damage or even break such hulls,” Porfiri says. For the time being, Spirit of Australia holds pride of place in the Australian Register of Historic Vessels as holder of the world water-speed record. But Ken Warby’s son David, reared in the speedboat culture, is working to surpass his dad’s feat with Spirit of Australia II. Charles Q. Choi is a New York-based freelance writer specializing in science. 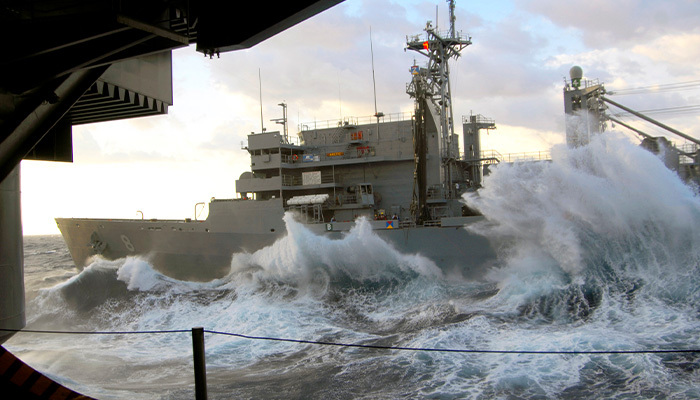 Image Courtesy of the U. S. Navy. Design by Francis Igot.